UUUGGH! THE COMIC CON HANGOVER…WHAT HAPPENED THIS WEEKEND? One of my all-time favorite films is THE HANGOVER. I laugh every time I see the guys wake up from a deep, deep drunken daze….but I gotta tell ya, that’s how I feel right now after this past week at Comic Con. Admit it….your head hurts. Your feet hurt. And your wallet hurts. It’s the day/week after San Diego Comic Con, and if you’re anything like us, you’ve got a bad case of Comic-Con hangover….and no amount of coffee or “hair of the dog” can fix it. It’s hard to return back to “normal life” immediately after the big convention, but life goes on, and so do we. But here are some “after the con” roundups and thoughts to help remember–and recover from–this year’s Con. THE HERO COMPLEX lists their Top 11 moments from the Con. And I’m kinda pissed to find out that YES, that was the Batmobile that drove past my car as I hopped back on Instate 5 after a day at the Con…and darn it, Zack Snyder was inside making a surprise appearance to the guests in Hall H at 2 a.m. 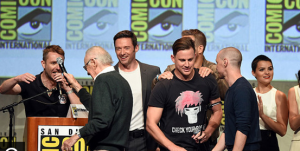 According to ENTERTAINMENT WEEKLY, “Comic-Con is over, but the buzz surrounding some of this year’s biggest movies and television shows will be heard for days.” They talk about the film and TV trailers that got the most buzz. Read more here. Meanwhile, over at io9.com, we get this: “Comic-Con 2015 is over—but our Comic-Con adventure is just beginning. Over the next week, we’ll be posting more of the exclusive interviews, strange discoveries, and fantastic moments from this year’s con. But meanwhile, how was it for you? What did you find most exciting, or the biggest disappointment?” Click here for more of their story. And finally, from E!Online: “That’s a wrap on 2015 Comic-Con! If you can just give us a minute to get over our nerd hangover (it’s a real thing), we can talk about all the awesome movie news that came out over the weekend.” Read full article here. C’mon, tell us how you cure your Comic-Con hangover. What’s your plan?